A section of the B.P Highway that collapsed into the Sun Kosi river on Sunday night could have cut the supply chain of Green Growth, but the new online shopping portal for organic produce has a built-in flexibility to survive setbacks. 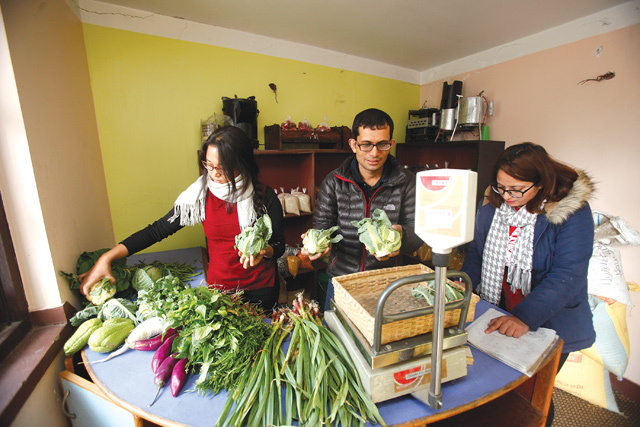 The innovative start-up delivering home-grown products relies on Nepal’s spreading highway network to source fruits and vegetables and sell them to urban consumers through the Net. “Usually we are well stocked for products that come from faraway places, so we were not affected by the blockage on the Sindhuli road, but we try to be prepared for all contingencies,” said Nischal Pokharel, in charge of Green Growth’s logistics. Every Monday, Wednesday and Saturday are delivery days, and Pokharel’s team is busy packing online orders into dispatch boxes of fresh greens and fruits that come from places like Kavre, Ilam, Mahottari, Sindhuli, Biratnagar and Jumla. Working out of a small warehouse in Gairigaun, the team sorts, packs, and sends out boxes of assorted vegetables and fruits much like an Amazon for local organic produce. “The idea is to connect farmers to consumers through the Net, and as long as farmers are benefitting and customers are getting the right product from the right place at the right price we are on the right track,”said Pokharel. Tired of the daily hassle of going to market and buying low quality vegetables possibly laced with pesticides, health-conscious customers are more than happy to log on to the site for a variety of made in Nepal supplies. “It has become extremely rare to find pesticide-free food in the market nowadays. None of the vegetables would last without it,” explained Rajeev Neupane, one of the portal’s consumers. Despite having his own farm in Duwakot of Bhaktapur, Neupane is a frequent online shopper on the Green Growth site for its carefully curated list of Jumla walnuts, Mustang apples, Sindhuli tangerine, or Ilam ghee. 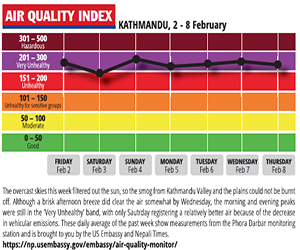 Green Growth is still a bit ahead of its time, but for increasingly health and environmentally-conscious consumers in Kathmandu it couldn't have come sooner. In just two years it has expanded beyond organic fruits and vegetables to also chemical-free soaps, fruit wines and plants from all over Nepal. Saurav Dhakal calls himself the ‘chief curator’ of the site, and says the business itself grew organically from a workshop he conducted in Jumla two years ago. Dhakal took to social media to sell the highest-grown rice in the world, and the response was so encouraging that it gave him the idea to start Green Growth. “We didn’t even have a business model or plan when we started, we just did it for fun, and I never imagined I would be selling vegetables through the Net,” said Dhakal who now has a new nickname among his friends: Tarkari-wala. Whenever Green Growth takes delivery of popular products like Jumla walnuts or fresh oranges from Sindhuli, the portal gets more than 100 subscribers per week. But due to limited storage space and the short shelf-life of perishables, Green Growth has to sell the products quickly and the Internet allows it to do that. “When they have Jumla’s walnuts in stock, I order 10kgs right away,”said Green Growth customer Rosha Chitrakar, who prefers the virtual market to the real one near her home in Kalimati. Although lacking in technology and resources, Green Growth is promoting a low carbon society in its own limited way. Nepal imports food, vegetables and even flowers from India, and Green Growth's approach appears to be the path to self-reliance. This year on Valentine’s Day, for instance, Green Growth sourced roses from Sankhu and sold them through its portal by-passing the city’s flower shops which imported roses from southern India. “We want to encourage Nepali consumers to buy Nepali products through a Nepali company,” said Samita Kapali of Green Growth, which charges farmers 20% of the sale price as service charge for connecting them to the market through its e-network. For the future, Green Growth is looking at ‘crowd-farming’ to make entire neighbourhoods farm organically so that the greater economy of scale will bring down prices and allow it to compete with markets in the city. Kapali said Green Growth strengthens the interdependence of rural and urban economies, and proves that change is possible.